The more you buy then the more voluble they may be, I suggest that you ask for 20 feet of the flo blue which is a reasonable size order. I am wondering how my Metaltech would look with pastel pink as previously I have used black and amber. Well now we have some numbers. 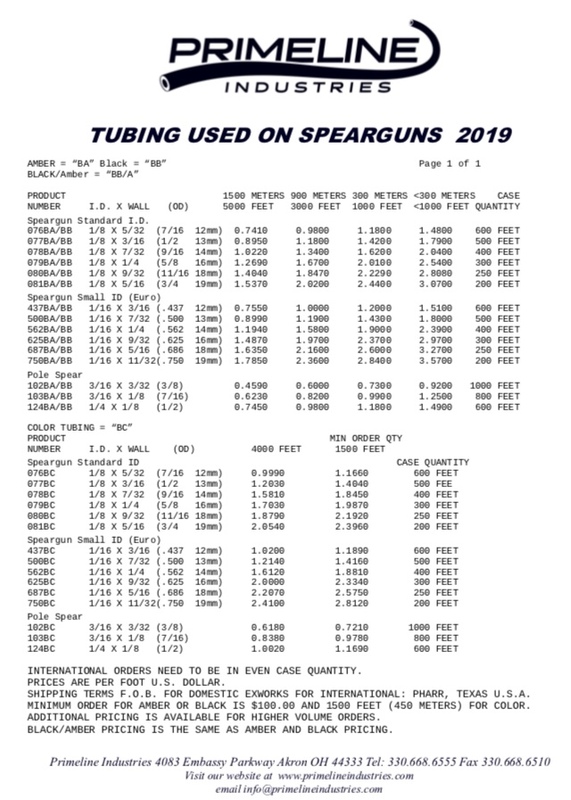 For a minimum run order of say teal in 14 mm small inner diameter band material the buyer has to stump up $2821.50 for the rubber which comes in at 3.75 cases of 400 feet each. I don't know how the company handle the 3/4 case extra unless they sell it as an odd lot of say 50 feet x 6. On top of that is the shipping cost, so maybe we are looking at under 2 bucks per foot if you buy from the manufacturer directly. If 100 divers wanted 15 feet each then that would be about 30 bucks each, so you need a group of 100 individuals who all want the same band size and color. Maybe create a Spearboard "band bank" for the buying and distribution of desired colors. Last edited by popgun pete; 03-18-2019 at 04:21 PM. I’m not spearheading anything like that. This guy seems low key I’m sure he’ll sell me whatever. Found the catch on ordering small batches. $45 shipping fee from Ohio to pa and a $15.00 penalty for under minimum order. I received a batch of small ID bands in fluorescent orange. Maybe it was a custom request from the person who ordered it, but I have to say I really like them. You can see those bands from a mile off on the surface, and they are great in open water where boats are around you and you want to improve your visibility in case a boat comes close to you. Not sure if the color spooks fish as that is not a natural color underwater, but so far I haven't noticed any noticeable change. Once you are below 15 feet the color seems to fade out quite well.